Night-time searches by torchlight have begun for a rare water beast in Powys. 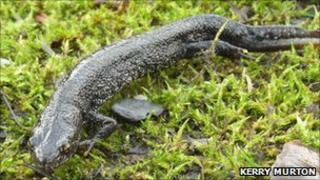 Wildlife volunteers want to know if great crested newts are breeding in Llandrindod Wells lake again after blue-green algae starved it of oxygen, killing thousands of fish. Brecknock and Radnor Amphibian and Reptile Group's (BRARG) survey will take place for three years every spring. Experts said the town's newts walked up to 500m from woodland to the lake. BRARG has spent a £400 grant from Powys council on high power torches, nets and high visibility jackets for its nocturnal hunt, but will carry out daylight surveys of the creatures as well. Thousands of fish died in 2006 when blue-green algae starved Llandrindod Wells lake of oxygen, but it has since been restored. Restoration work cost more than £400,000, and specialist aquatic engineers were hired in 2008 to help with the project. Darylle Hardy, a Radnorshire Wildlife Trust and BRARG member, said: "It is essential that amphibian populations are safeguarded at this time. "The breeding adults are the ones who ensure that there'll be frogs, toads and newts around in the future. "We want to see if the newts are returning to the lake after the restoration project." Great crested newts are Britain's largest newt species, although now afforded some legal protection in the UK, populations have declined over recent years as a result of the destruction of their habitat. Councillor Gwyn Gwillim, who is responsible for outdoor recreation and biodiversity in Powys, said: "We're grateful to our local volunteer experts for their help in ascertaining how great crested newts might be benefiting from the recent ecological improvements to the lake." BRARG members were also out in force with volunteers for Radnorshire Wildlife Trust's annual toad patrol. The patrollers help hundreds of migrating toads across a road around the lake when it is closed to traffic for the nightly migration period. Last year, Powys council opened two special "toad tunnels" under the road.